Black, White and Halloween all over. Sam and Lisa decided on a fun-filled wedding at the Hyatt Regency Orlando. 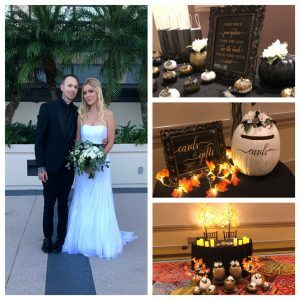 Since Sam worked in special effects for Universal Studios and both he and Lisa had a love for Halloween and the color black, it made for a classy and interesting wedding. With tables draped in black table cloths, candles, and accentuated with pumpkins of all sizes and colors it was a sight to behold. Tracy Marini and Ashley Simonds with Eventually Yours coordinated the event from start to finish. Details of a white pumpkin card box, a trick or treat station for guests, and miniature pumpkins for place card holders, all filled in the details of the theme. Tabitha with Our DJ Rocks was rockin the house with great music all night long. Cornerhouse Photography captured every moment of their special day. I have loved Lisa since the first day we met – for so many reasons. We both love Halloween, horror movies, Black Sabbath and of course the color black! I love that Lisa is herself around me and I have always been myself around her. Lisa is caring and supportive – she always pushed me to pursue my goals and is responsible for so many of the directions that allowed me to grow as an artist. She joined me in a trek across the country for a job – if that’s not love I don’t know what is! What I love most about Lisa though is her compassion. One of the many things we share is our love of animals and Lisa’s love knows no boundary. It’s not just animals though – her compassion towards all living things continuously amazes me. Lisa’s beauty made me take notice but her heart is what makes me love her. I love the way Sam makes me laugh. I love that he always encourages and supports me. He’s a great listener, and inspires me as a hardworking and generous person. I love that there’s always a balance between us, we’re always there to help lift one another up. He helps me through any obstacle. He is my perfect match in every possible way, it’s so comforting to share the same interests, environmental views, and lifestyle choices with him. I believe it goes so much deeper than a physical connection, we are intertwined on a metaphysical level that I constantly recognize in so many little ways. Sam is truly a part of my soul, he loves me wholeheartedly and always makes me feel important, secure, and like the only person in his world. Congratulations Lisa and Sam. We wish you many happy Halloweens to come!